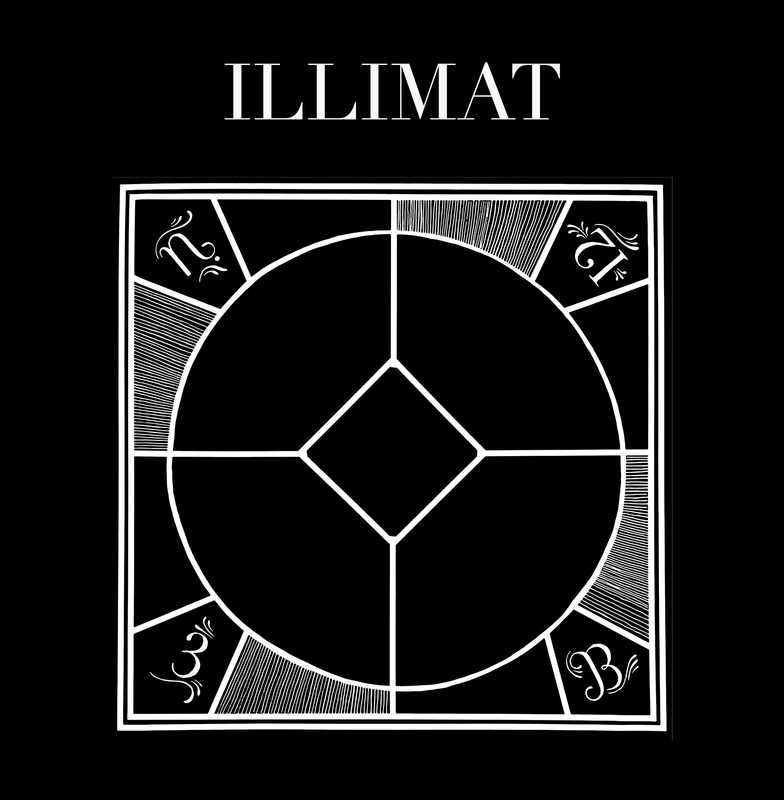 It’s been such a long time coming, but ILLIMAT, the game we helped foster into the world alongside Keith Baker, is NOW available in fine, upstanding game stores everywhere. 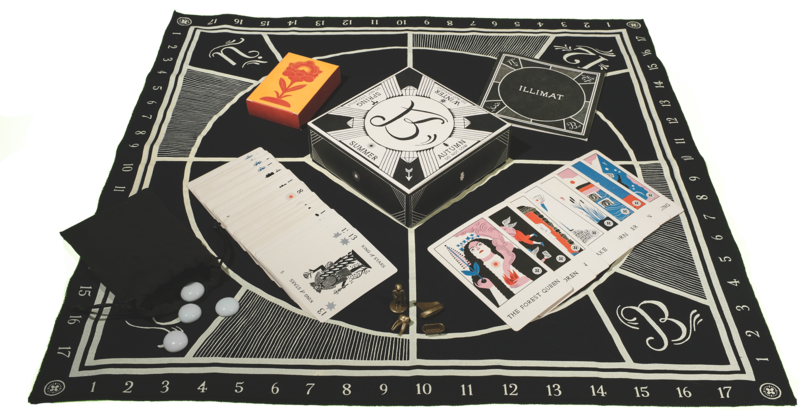 For those among you for whom that sentence is a garble of nouns and verbs, know that ILLIMAT is a card/board game, designed by Keith Baker and the band, based on a prop Carson Ellis and Autumn de Wilde made for a photo shoot in 2009. It is *also* an ancient pastime, played in secret by a strange organization called the Society of Luminaries. Take your pick, really. But more importantly: YOU CAN BUY IT AND PLAY IT TODAY! Check it out at our webshop, DecemberistsShop.com, illimat.com, or, as we said above, your favorite neighborhood indie game store. We’re super proud of it. Carson did all the artwork for it and it’s really a thing of beauty. Special thanks to all the backers (and there are 5,963 of you lovely creatures) for supporting this weird idea and making it a reality. 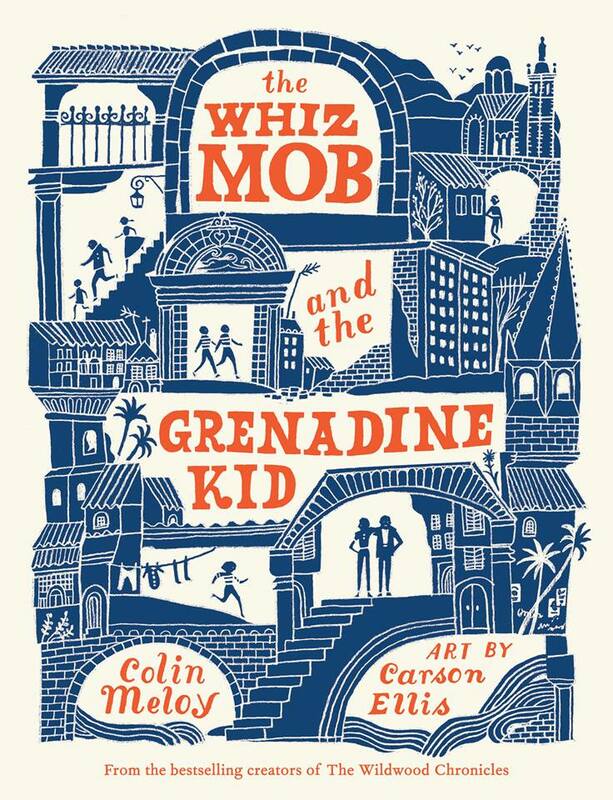 You would also be perhaps interested to know that Colin’s new book THE WHIZ MOB AND THE GRENADINE KID is out in the world, resting on the shelves of upstanding bookstores everywhere. It’s about a gang of pickpockets in Marseille, France, in 1961 and is really intended for the 9-12 year-old set, but grown ups have been known to read it and enjoy it immensely. GIT IT! 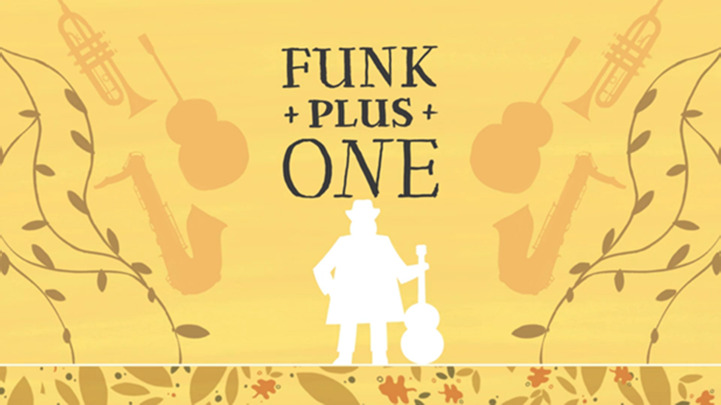 Funk has a new video series, 'Funk Plus One,' on Great Big Story which finds him on the road in search of surprising and extraordinary people in music. The first episode with Gaelynn Lea premiered last week and the second episode with Jerron “Blind Boy” Paxton just came out today. They’re also running a sweepstakes to give away a Supro guitar signed by Funk, you can learn more on the @GreatBigStory Instagram account or visit here for the official rules. John’s band Eyelids just wrapped up an East Coast tour, but if you missed it, you can watch replays of their WNYC Soundcheck and Paste Studio performances now. Visit musicofeyelids.com for more info and check out their most recent album, or. 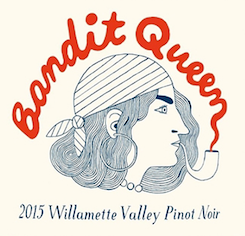 In other band-tangentially-related news, there are still cases of Bandit Queen wine available in time for holiday imbibing. We’re still working on the 2016 vintage, but the 2015 is particularly tasty — and is ready to drink now! Order yourself up a few here! Speaking of the holidays, we happened to contribute a cover of Big Star’s “Jesus Christ” to the Holidays Rule Vol. 2 compilation. You can download or stream the album now here. Looking into 2018, we’ll be performing at Innings Festival in Tempe, AZ on March 24. Single day tickets are on sale now here. While this is currently the only show on the docket, rest assured that won’t remain the case for too long (but more on that in the new year). Holidays Rule Vol. 2 is out today, which includes our cover of Big Star’s “Jesus Christ.” You can download or stream the album now here. We Decemberists are thrilled to announce that our side-project with the inimitable Olivia Chaney in which we play an unsuspecting 60s psych-folk band with a terrible secret IS OUT TODAY! It’s called The Queen of Hearts and it’s available anywhere you, adored listener, interface with music-listening apparatus — i.e. iTunes, Apple Music, Spotify, Blorf, Quad, Jips, or, heaven forfend, YOUR LOCAL BRICK AND MORTAR RECORD SHOP. If you haven’t already, you can pre-order the album now and receive an instant download of the four tracks we’ve previewed so far. For more on the project, you can read Colin and Olivia’s interview with The Bluegrass Situation here. Olivia Chaney recently spoke with Lenny about our collaboration and the new track, you can read the interview here. We’re a little over two months away from The Shuffling Off to Ragnarok Summer Tour and we’ve added in a few more stops along the way – Edmonton Folk Music Festival on August 10 and the Mondavi Center in Davis, CA August 18. Tickets and The Whole Shebang Super Concert Action Packages for Davis are on sale now, Edmonton Folk goes on sale June 4. If you’ve already purchased a ticket for one of the other shows on the tour but would like to get in on the pre-show performance/Q&A, signed tour poster, and more, TWSSCAP Upgrades are now available as well. If you need a refresher on Offa Rex, our collaboration with Olivia Chaney, think Albion Dance Band/Steeleye Span/Anne Briggs. Traditional folk songs through the lens of the 60’s and 70’s British Folk Revival plus a few originals from that era by Ewan MacColl and Lal Waterson. 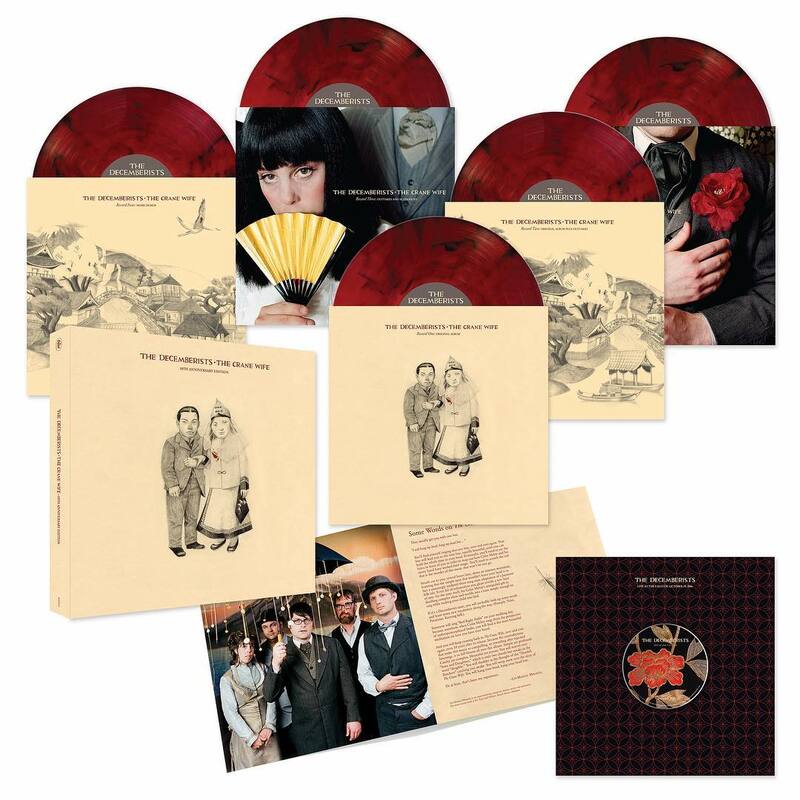 “Blackleg Miner” is available now as an instant download, along with the title track, when you pre-order The Queen of Hearts on CD, vinyl, or via iTunes. Due to a slight delay in vinyl production, the album’s release date has been pushed back one week to July 14, but we’ll have another new track to share in the coming weeks to help hold you over in the interim. Tickets for the Offa Rex show in Portland on July 23 are sold out but a limited supply still remain for the NYC show at The Town Hall on July 26 here. Aside from festival sets as XPoNential, Newport Folk, and Travelers’ Rest, these are the only two Offa Rex dates on the docket. However, those of you coming to The Shuffling Off to Ragnarok Summer Tour shouldn’t be surprised to see Offa Rex make a mid-set appearance for a few songs. We look forward to sharing more music and seeing as many of you this summer as our touring and your personal travel thresholds will allow. 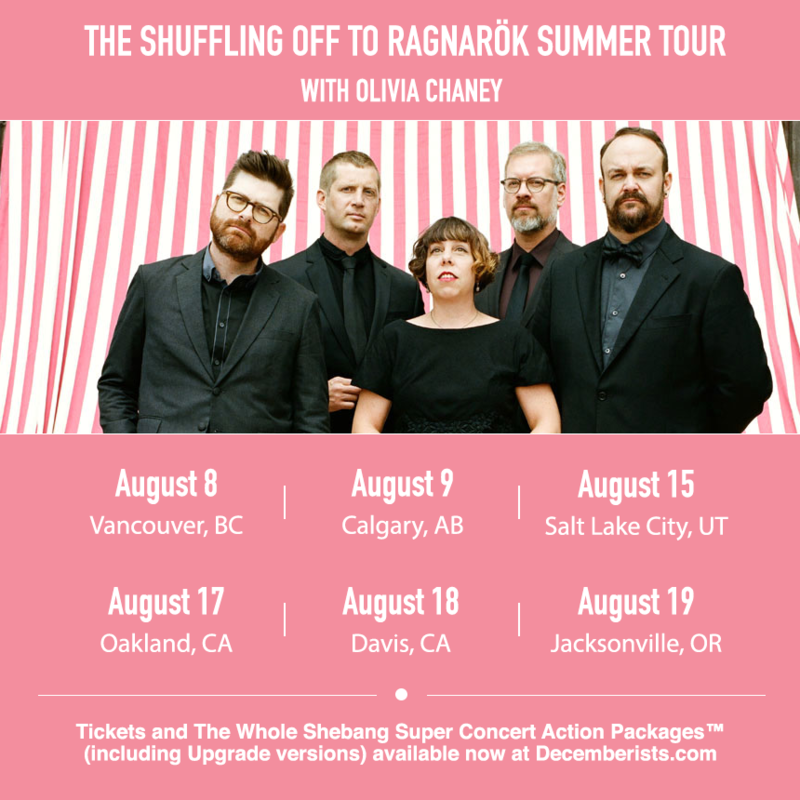 The Shuffling Off to Ragnarok Summer Tour has been expanded to include Davis, CA with a show at the Mondavi Center on August 18 with Olivia Chaney! We’re offering The Whole Shebang Super Concert Action Packages for this new date along with the rest of the stops on the tour. If you’ve already purchased a standard ticket for one of the shows but would like to get in on the pre-show performance/Q&A, signed tour poster, and more, Upgrade versions are now available as well. 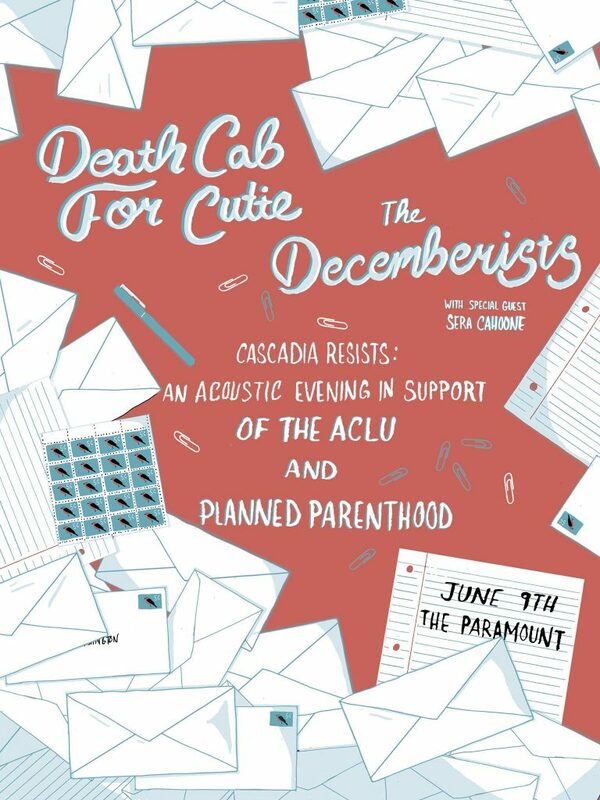 Join us and Death Cab for Cutie and Sera Cahoone in Seattle on June 9 at the Paramount Theatre for Cascadia Resists: An Acoustic Evening in Support of the ACLU and Planned Parenthood. Tickets will go on sale Friday, May 12 at 10am PT and will be available for purchase here. We’re pleased to announce a special event prior to the show. Colin Meloy and Benjamin Gibbard will perform short solo sets for a very limited number of fans and take part in a meet & greet with photos. Passes for this pre-show event will be available as an add-on to your ticket to the main show when they go on sale this Friday. If you are unable to attend the show but are interested in supporting these great organizations, please visit ACLU and Planned Parenthood to see how you can help. The disembodied entity who typically writes these missives is on vacation; this is being written by me, Colin Meloy. And I want to bend your ear about something. A few years ago, I had a chance to hear a record by a fantastic artist, one Olivia Chaney. She made a record called The Longest River and I was so taken by it, particularly her arrangement of the old folk song “The False Bride.” She seemed to me to be channeling the great female folk singers of the British folk revival: Sandy Denny, Anne Briggs, June Tabor, Norma & Lal Waterson, Shirley Collins and Maddy Prior. We invited her to open a bunch of Decemberists shows in 2015 and afterward I made a pitch to her: let us be the Albion Dance Band to your Shirley Collins. Let’s start a band. Let’s make a record of old folk songs that will be as much about rediscovering ancient songs as it is an homage to that incredible era of British music, the 60s and 70s folk revival. 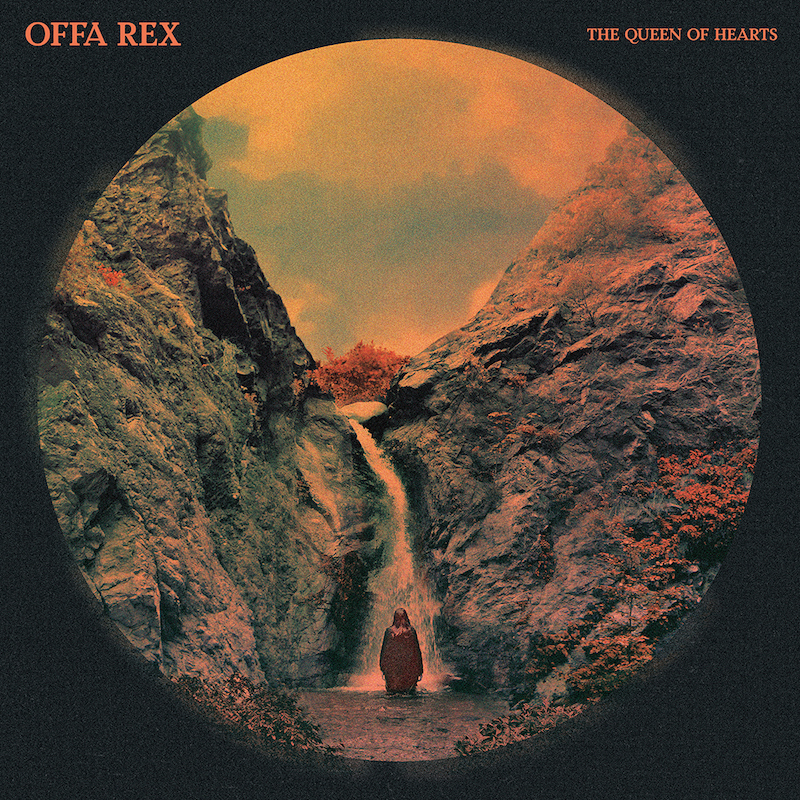 And so we Decemberists are very proud to announce the arrival of OFFA REX, our collaboration between the band and Olivia Chaney. You can listen to “The Queen of Hearts,” a song we learned from Martin Carthy, here. It’s about heartbreak in the face of unrequited love; to my ears it’s as fresh today as it was when it was written three hundred years ago. That’s kind of the spirit of the record. Offa Rex will be playing a pair of shows in Portland and New York City in late July, leading into XPoNential Festival in Philadelphia and Newport Folk Festival. We’re also playing Travelers’ Rest, the festival the band is hosting in Missoula, Montana in August. Well be performing songs from the record as well as songs from the Olivia Chaney and Decemberists catalogues, reimagined through the lens of Offa Rex. And expect to see Offa Rex appear, mid-set, for a couple songs when Olivia opens The Decemberists’ summer tour dates. You can find all of the details below. We hope you are as taken by this music as we all have been.